This entry was posted on March 13, 2015 by Andie Pantazi. We all know you have a lot of things to consider when it comes to your academic life. You may have student loans to pay off and various other items to buy such as textbooks and supplies, but you may not be prepared for the cost of your graduation apparel once you graduate. So how do you keep things on a budget when it comes to buying your cap and gown set? Fortunately, you can purchase a good graduation set even when things get really tight. Here are a few factors you should keep in mind. The saying “you get what you pay for” is mostly true. Purchasing unrealistically cheap items may backfire eventually, and this includes graduation apparel. Before setting your eyes on anything inexpensive, do some research on the quality and build of the product. If you’re thinking of , then do look into its current condition, even though it was a high-quality product when it was first bought. There could be some wear and tear in certain places which may spoil the graduation experience for you. You may also want to consider repair costs and other things. This is obvious, but many don’t seem to know how to balance their current budget with the prices of the items they are going to buy. You can’t just simply start with a certain amount and find apparel within that range. You first need to do some research on cheap but good-quality apparel before allocating a budget. That way, you’ll be immune to unpleasant surprises. If you’re finally buying your own graduation apparel one of these days, then always take into account the balance between quality and price. Always go for inexpensive quality apparel, so as not to hurt both your wallet and your reputation. 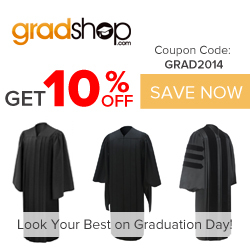 You may view GradShop's catalog to help you with your search.